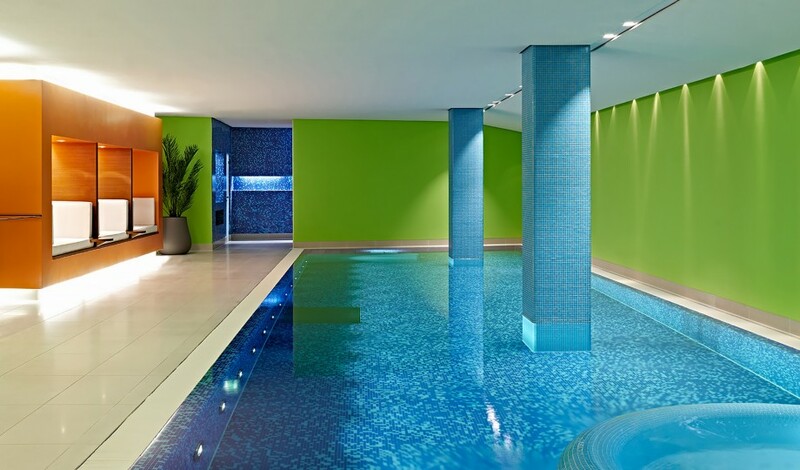 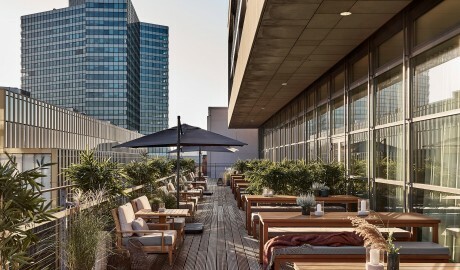 —Emerging from Hamburg's staid residential area is an urban-chic statement in style, where private spaces are sanctuaries and public areas bubble with fun and possibility. 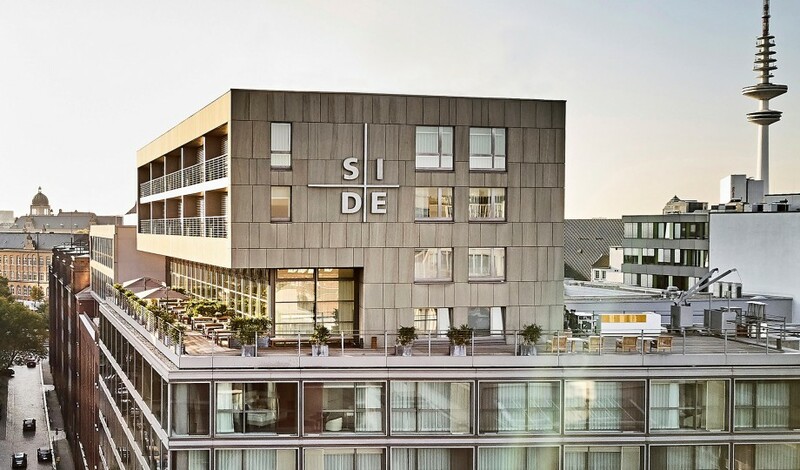 Located near the Alster Lake and the city’s shopping district, Side hotel sets a soaring stage for a dramatic lighting concept by theater virtuoso Robert Wilson. 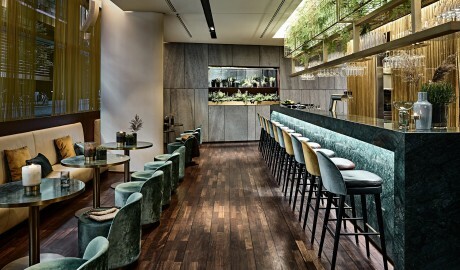 The stark drama is softened through interiors by Milan designer Matteo Thun, whose rounded surfaces and carefully chosen colors create aesthetic warmth and vitality. 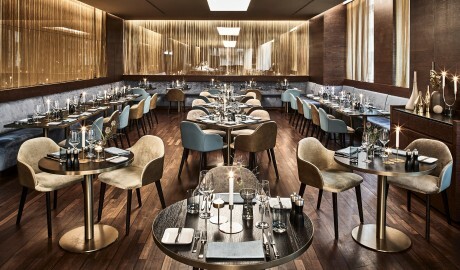 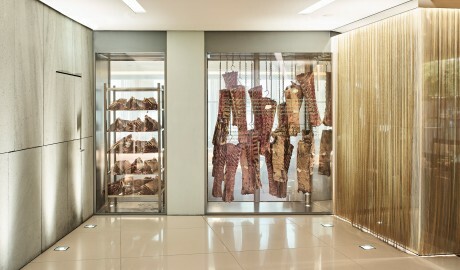 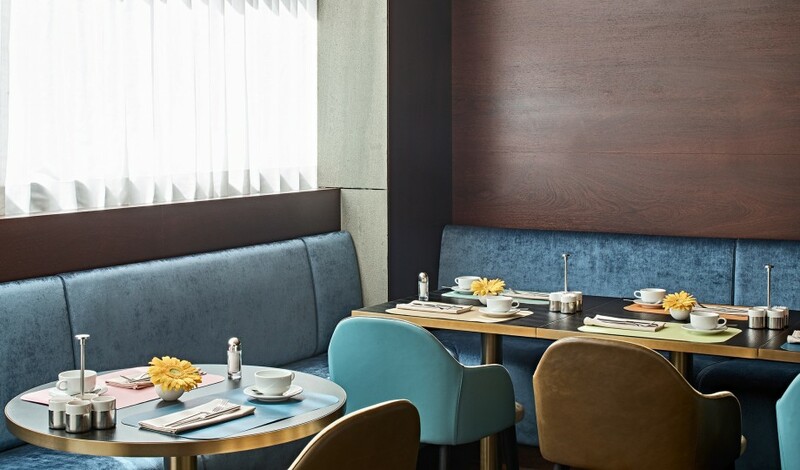 Guests and in-the-know locals enjoy the lounge's voluptuous, round furnishings and [m]eatery bar + restaurant, where an 800-degree infrared oven and an exclusive dry-aging process cook up delicious steaks with quality meats from Argentina, the United States, and Germany. 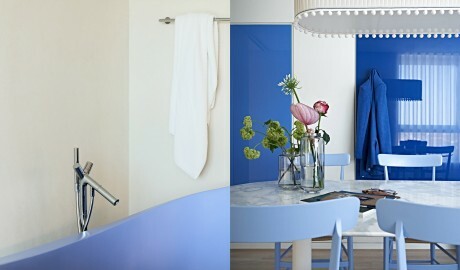 While the color palette in the bar is a dark and stormy affair, guests enjoy soothing and creamy hues in their rooms. 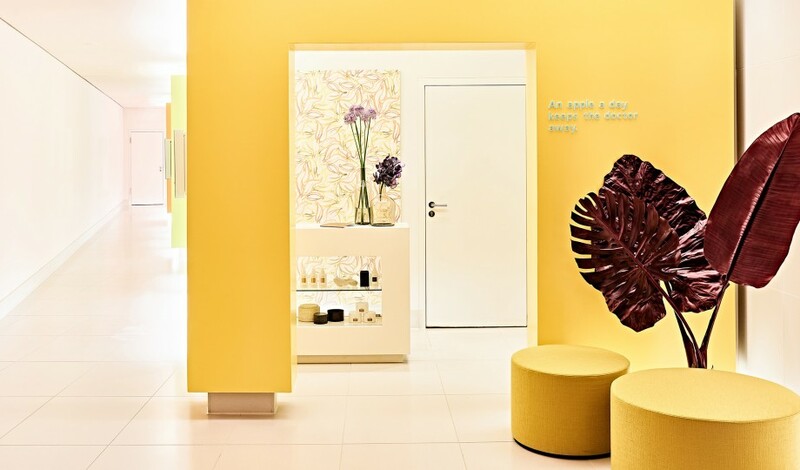 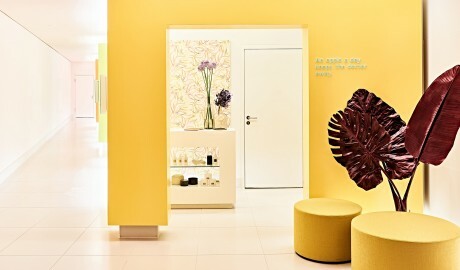 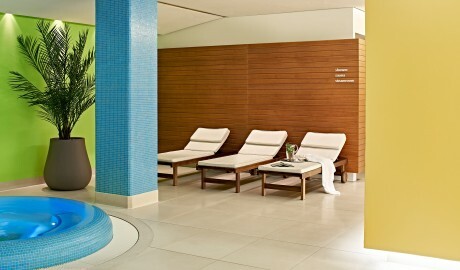 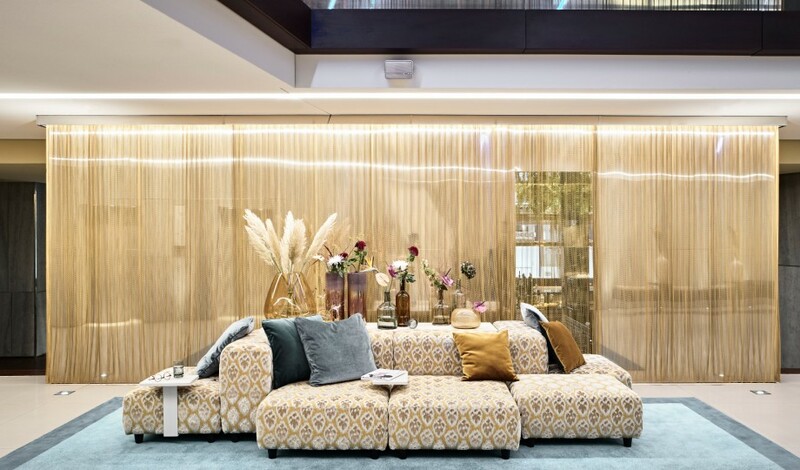 The generous public spaces feature bold tones and lush velvets, such as energetic oranges and warm yellow walls in the restorative spa treatment rooms. 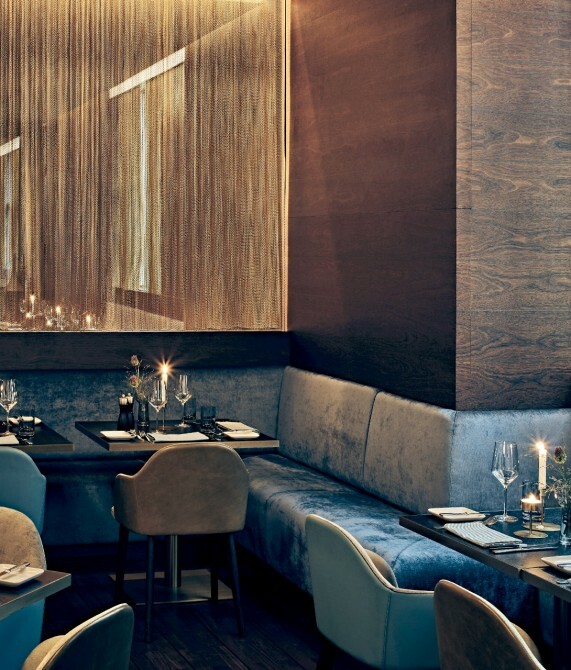 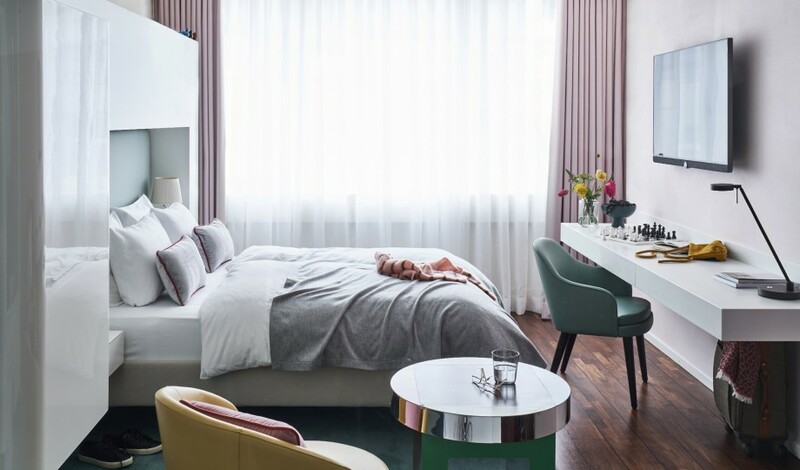 Designed as a stark contrast to the vibrant colors in the public spaces, the 178 rooms and suites at Side hotel, in Hamburg, offer up a soothing canvas of buttery creams and sumptuous browns. 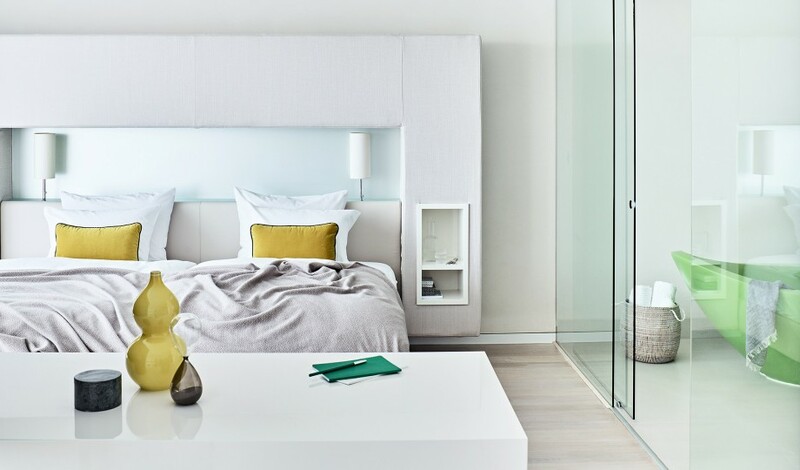 The Italian designer Matteo Thun’s sober minimalism provides just the right dose of Zen in the city’s center. 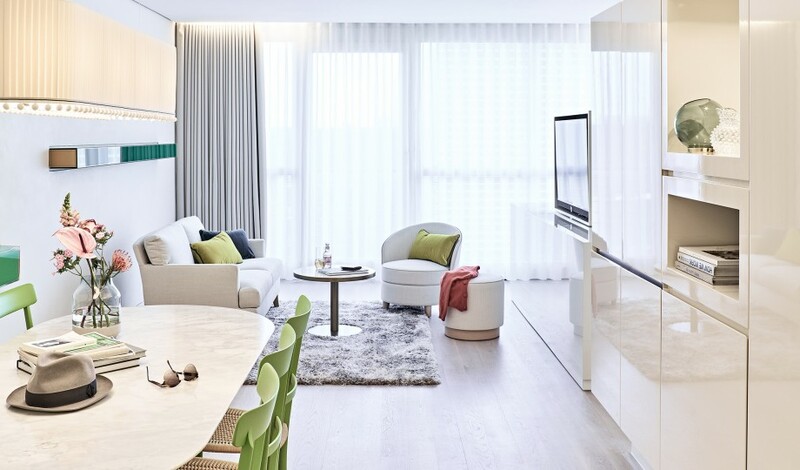 The “flying” suites, located on the 10th and 11th floors, are a study in purism with limed oak flooring, glossy furniture highlighted with light boards, colored bath tubs, and suites each offering its own color tone. 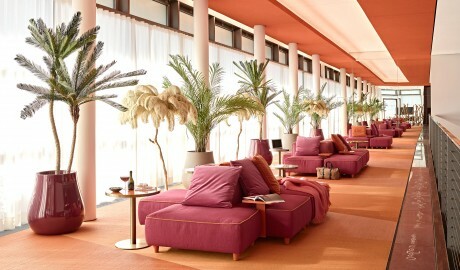 The “Super Sassis” furniture collection by Thun supplies the sculptural-looking, comfortable seating. 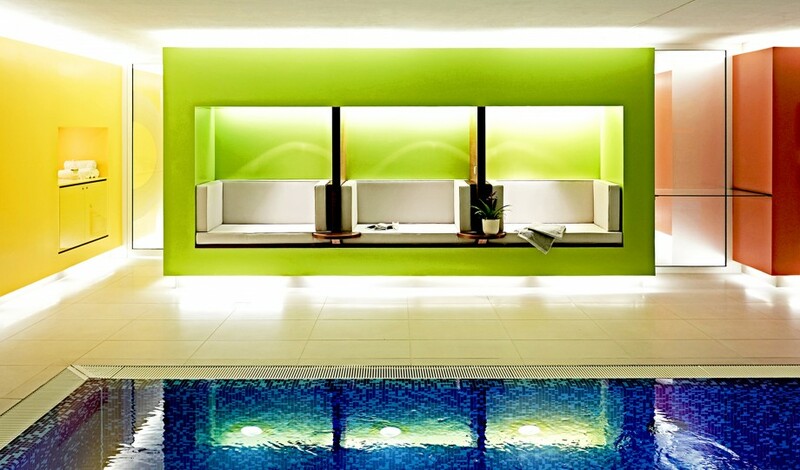 The purism also translates into floating glass basins in the spacious bathrooms. 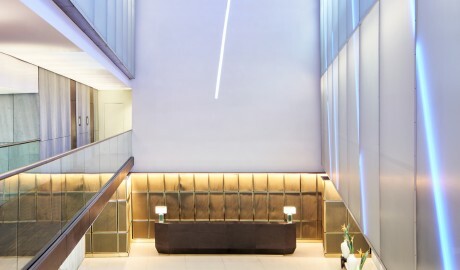 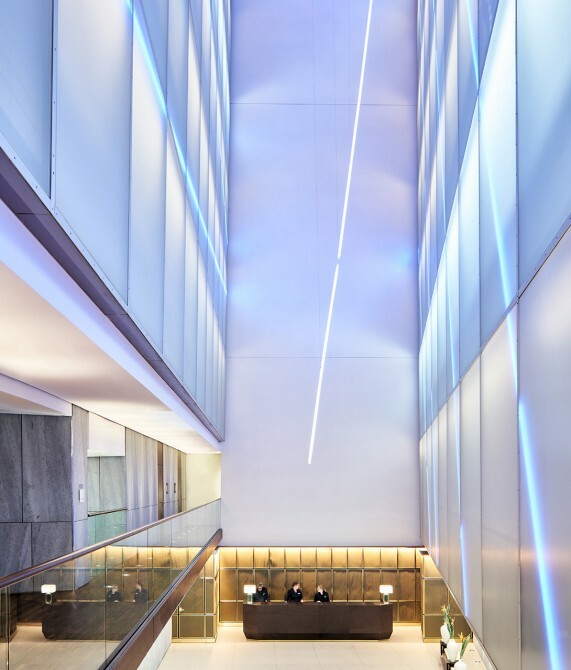 The multisensory experience starts as soon as you step into the hotel’s atrium, where a constantly changing light installation engages the senses. Matteo Thun’s first hospitality project, the Side Hotel presents a green stone façade that hides a light-filled, eight-story atrium at the center of the building. 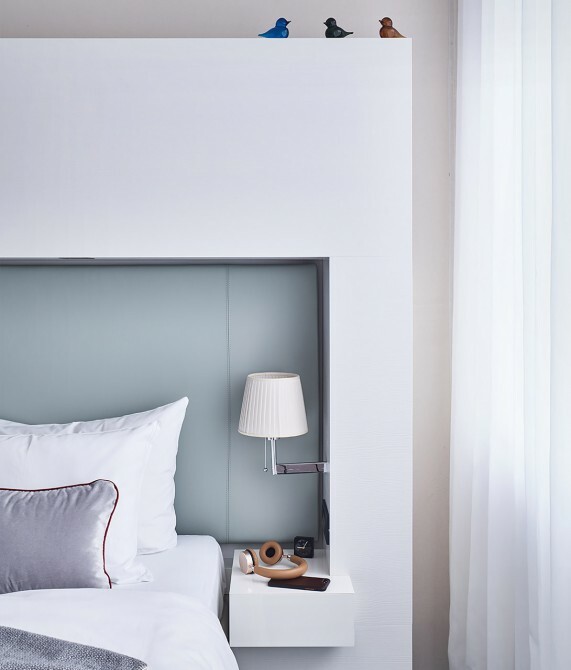 Having grown up in hotel development alongside his father, Hamburg native Gregor Gerlach knew the business was in his blood. 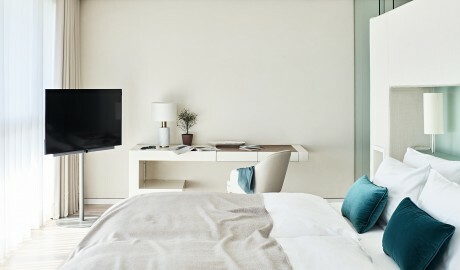 He is currently the CEO of the world-class Seaside Hotels, which was initially launched by his father Theo and now has luxury and boutique hotels in Hamburg and across Germany and Spain. 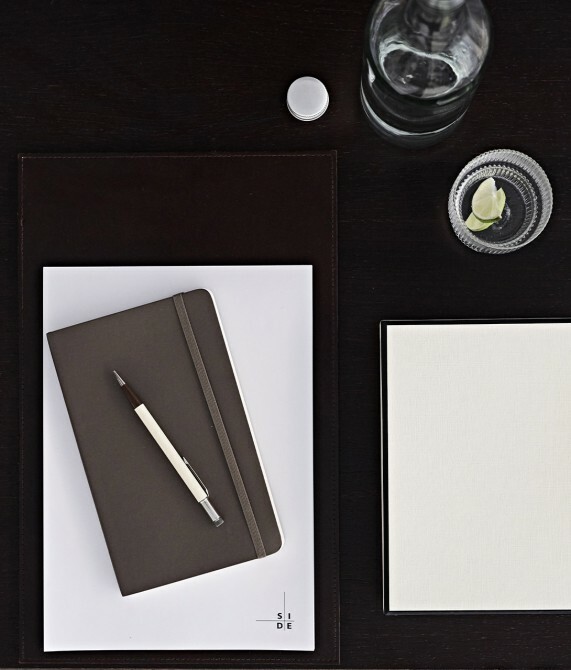 Gerlach spent four years with McKinsey after receiving his MBA in junior business administration from the Kellogg School of Management at Northwestern University in Chicago. He was also an original investor in and founder of Vapiano, a successful Italian restaurant franchise, and continues to serve as the chairman of the board. On weekends, Gerlach can be seen relaxing at the Hamburg Polo Club, which is among his favorite places to be, he admits. His jeweled seaside resorts are a close second. The Neustadt (New Town), which along with the Altstadt (Old Town), forms Hamburg’s Innenstadt (Inner City) and plays host to an array of cultural attractions, as well as some of the city’s finer culinary establishments, drinking spots, attractions, and upscale shops.